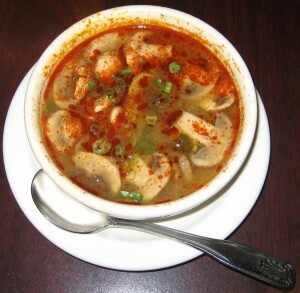 The classic spicy Thai soup with mushroom, scallions and choice of shrimp or chicken in shrimp broth. This is a very spicy yet tangy soup that will set your mouth on fire. We took a sip and had to relieve our throat with a glass of water. This is not a pleasant or soothing soup, so order at your own risk! Coated in coconut batter and golden fried to perfection. Served with spicy mayonnaise sauce. This fusion dish caught our eye so we decided we must try it. The coconut shell is reminiscent of a delicious macaroon. The shrimp was decent – not chewy at all. 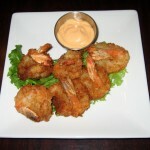 The coconut was bit overpowering but still complemented the shrimp nicely. The spicy mayonnaise was delicious but keep in mind that it would make cardboard taste great. Overall, this dish was okay, but we’ll probably get the crab cakes next time. 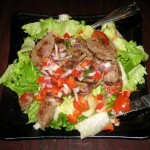 Grilled top sirloin tossed in onions, scallions, tomato, cucumber, lemongrass, garlic, bell pepper, lettuce and Thai chili. 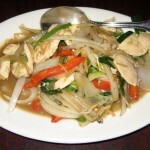 If you read some of our other reviews, you will notice that we order this whenever we eat Thai. This is a very difficult dish for restaurants to get right and is usually a good indicator of the quality of the eatery. Unfortunately, Ka-Prow did a terrible job with this one. The biggest problem is that the beef was overcooked, therefore dry and very chewy. Some pieces were edible (with lots of work), but others were definitely not. Yuck! Also, we were disappointed at the amount of vegetables – specifically the non-existence of tomatoes and cucumbers. Ka-Prow shamefully joins Thai Cuisine and Pad Thai as places that haven’t lived up to the challenge. The title of “Best Yum Nur in Austin” rests safely with Titaya’s! 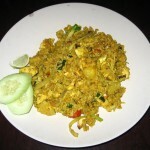 Stir-fried rice with pineapple, onions, scallions, tomatoes, raisins, garlic, egg, cashews and your choice of meat. In the past we have ordered this dish and enjoyed it very much – we bet the picture just make you want to devour it! However, something was not right with it. Most of the rice was grainy and had a cous-cous like feel to it. It was like we were eating broken bits of rice rather than long, full, grains. Also, there was no pineapple flavor, unless you got lucky and ate one of the few pieces they included in your bite. On a brighter note, the dish was not dry at all and the chicken was soft and tender. The cashews and raisins add a fun dimension, but not enough to make up for lack of flavor. Maybe the chef was having an off-day so we won’t give up on it just yet. Stir-fried young ginger with onions, scallions, bell peppers, garlic and choice of meat. This entree came out exactly how we expected based on the description – plain and simple. There is no curry, brown sauce, or Thai chili in here – just a soupy broth that contains a strong ginger flavor. The chicken is tender and there is an abundance of onions, but the portion size is for one small person. If you are looking to eat light, this could be right for you. Spicy tuna with avocado and topped with masago and spicy sauce. Ka-Prow has an extensive sushi selection, and we thought this Chef’s special of the day sounded like a winner. This hearty roll is stuffed generously with spicy tuna and avocado. The tuna is soft, fresh, and bursting with flavor. The sauce has a wonderful kick to it, but didn’t set our mouth on fire like the Tom Yum soup did! The seaweed was easy to chew and the amount of rice was just right. However, there was no crunchy tempura flakes as the name suggests. 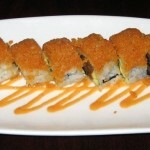 We recommend this yummy roll, and we were amazed that it was only ten dollars! We dined at Ka-Prow for lunch on a quiet Sunday afternoon. There is usually a hostess that greets patrons, but today the lone waiter took over this duty. We were shocked to see that we were the only diners at the restaurant, so we had plenty of tables to choose from. Our waiter was soft-spoken and not too personable, but he did his job well. The appetizers and entrees came out at appropriate intervals and he checked on us several times throughout our meal. At one point however, we needed some hot sauce but could not find him anywhere. Overall, the service is good and has been consistent on several different occasions. The word “Ka-Prow” means basil in the Thai language. This place is a mid-sized eatery that has one large room, one smaller room, and a limited amount of bar seating. This place is clean and tastefully decorated, with modern influences. The atmosphere can be summed up as intimate and cozy, with good lighting. On weekends, they have live music, which usually consists of easy-listening or soft jazz. Ka-Prow refers to their restaurant as being a Pan-Asian Bistro, and this is apparent in their wide variety of menu items. Unfortunately, it seems that some of their dishes lack authentic flavors. It may be best to try Ka-Prow during happy hour because the sushi is worth exploring.